Nineteen stations in 15 markets will pull in a cash price of $1.32 billion. Tegna will acquire 11 stations in eight markets for $740 million, with Scripps buying eight stations in seven markets for $580 million. The biggest TV station markets to be sold -- WPIX New York, KASW Phoenix, WSFL Miami, and KSTU Salt Lake City -- will go to Scripps. In addition, Nexstar says it is in active negotiations to sell two stations in Indianapolis, Indiana. In December 2018, Nexstar inked an agreement to buy Tribune Media for $4.1 billion. The planned divestiture of 19 stations is part of that agreement, in compliance with FCC rules. The $1.32 billion in sales will help to lower debt around the deal. The Wednesday morning stock price of Nexstar was up 0.1% at $105.74, while Tribune Media was down 0.1% to $46.05. Scripps was down 1.3% to $22.19; and Tegna was off 2% to $14.14. 4 comments about "Nexstar Sells 19 Stations To Tegna, Scripps For $1.32 Billion". Pam Livolsi from Media Intelligence, March 22, 2019 at 10:25 a.m.
Only months ago Tribune was going to be bought by Sinclair Broadcasting. Then a brush fire of negative publicity about Sinclair's use of "news talking points" to all of their local stations, blew through social media, and all of a sudden the deal was off and Sinclair was getting sued by Tribune for what amounts to a subjective claim. That brush fire of negative publicity had all the markings of a manufactured story using artificial intelligence and bot-nets. Only months later, Nexstar is now buying Tribune. The whole thing looks manufactured. Considering that the race for reach dominance among station group owners is such a big deal, this should be investigated before any approval of the Tribune/Nexstar deal is given, especially because Sinclair is described as a more conservative group. This could impact the 2020 election and should be taken seriously. Pam Livolsi from Media Intelligence, March 22, 2019 at 10:56 a.m.
A simple search shows that Lin Digital is a division of Nexstar and they offer "long-form video seeding" as a service to amplify video messaging. The FCC and Ajit Pai really should investigate this whole situation. 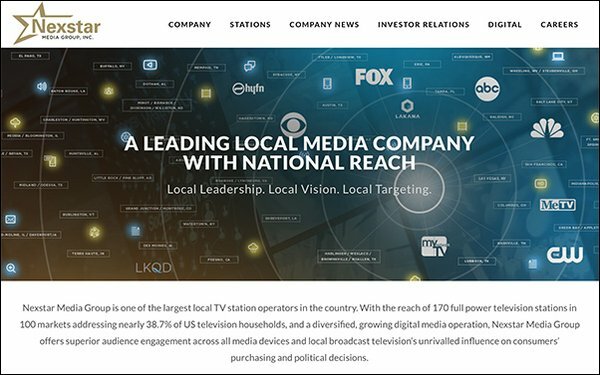 Pam Livolsi from Media Intelligence, March 22, 2019 at 11:04 a.m.
On Dec. 3, 2018, in an announcement on the Tribune Media website, Perry Sook, Chairman, President and CEO of Nexstar, commented, “Nexstar has long viewed the acquisition of Tribune Media as a strategically, financially and operationally compelling opportunity that brings immediate value to shareholders of both companies." Long viewed? Now there even appears to be motive. Pam Livolsi from Media Intelligence, March 22, 2019 at 11:47 a.m. It was reported that Sinclair’s name recognition spiked and the deal fell through after Deadspin amplified a video that showed a compilation of the synchronized Sinclair station “biased news” must-run segment. There was no mention that Sinclair has been distributing themed headlines through local news stations for years. According to Wikipedia, Deadspin is described as a sports news and blog website, originally founded by Gawker Media, and currently owned by the Gizmodo Media Group, subsidiary of Univision Communications' Fusion Media Group. Long-form video seeding, the service offered by Nexstar's digital subsidiary, Lin Digital, is activated by submitting video to blog sites for viral amplification, and Deadspin is a blog website. This really needs to be investigated. Was Nexstar behind the Sinclair video in order to cause the Sinclair/Tribune deal to fall through so that Nexstar could buy it?